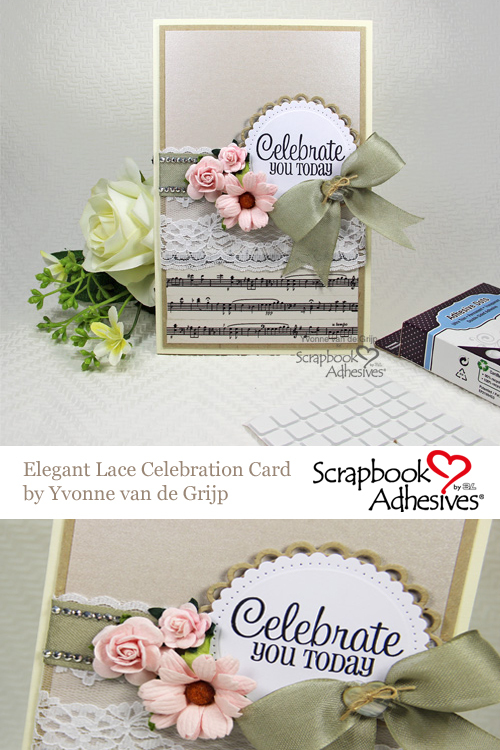 Hi everyone, Yvonne here with a lace wrapped celebration card. It was so easy to assemble, especially when you use products from Scrapbook Adhesives by 3L®. 🙂 Lace is a timeless element with a touch of elegance so I always like having some in my stash ready to use! 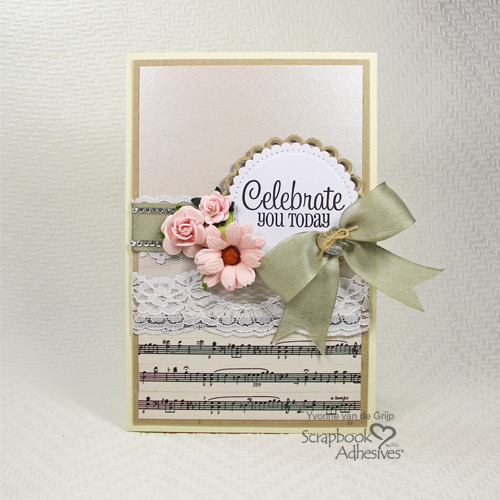 With a rectangle piece of beige pearl cardstock, cover the bottom part with music notes designed washi tape. Wrap the ends of the washi tape to the back of the card panel for a finished look. Affix to a kraft card panel using the E-Z Runner® Grand Refillable Dispenser. Trim a piece of white lace slightly wider than the layered card base. Wrap around the layered card base with the lace ends adhered on the back with E-Z Runner® Grand Refillable Dispenser. Repeat with the piece of beige ribbon going around the card panel the same manner. Lastly, adhere the laced panel onto a creme card base using the E-Z Runner® Grand Refillable Dispenser. Stamp the sentiment onto white cardstock and cut/emboss a circle from the cardstock. Affix the stamped die cut to a circle that was die-cut from kraft cardstock using 3D Foam Squares White Regular Size. Adhere the stacked die cuts onto the card using 3D Foam Squares White Regular Size. Add some rhinestone strips onto the top and bottom of the ribbon. To adhere the mulberry flowers, the bow and the pearl heart button with Adhesive Dots Medium. And….Voila, your card is ready. Wishing you happy crafting! This entry was posted in 3D Foam Squares, Adhesive Dots & Lines, Cards, E-Z Runner® Grand, Intermediate and tagged 3D Foam Squares Mix White, 3D Foam Squares Regular White, Adhesive Dots Medium, Card, Card Making, Celebrate, E-Z Runner and E-Z Squares Combo Value Pack, E-Z Runner Combo Value Pack, E-Z Runner Grand Dispenser, E-Z Runner Grand Permanent Strips Refill, E-Z Runner Permanent Strips, E-Z Runner Permanent Strips Refill, E-Z Runner Permanent Strips Refillable, E-Z Runner Permanent Strips Refillable Value Pack, E-Z Runner Refill Value Pack, lace, Yvonne van de Grijp. Bookmark the permalink. 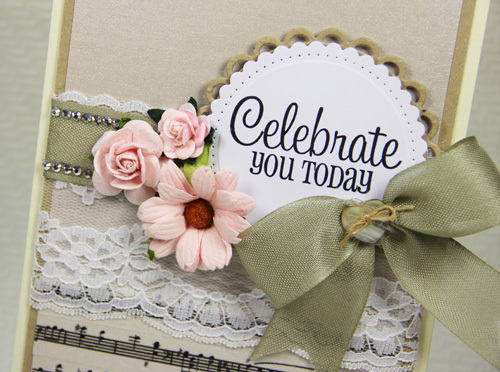 One Response to "Elegant Lace Celebration Card"
This is absolutely gorgeous and elegant card. LOVE everything on it.